Today, mountaineering community is really growing unlike before (from 70-90's) only few were engaged to this outdoor activity. Before, a lot of individuals get involved or experienced trekking and camping through Scouting. Now, most of the individuals are so active in doing mountaineering activities due to health reason and also for recreation. With this observation, thephilippinemountaineering.com decided to facilitate a Classroom-base Basic Mountaineering Course on October 26th in Quezon City Philippines. The activity will be in partnership with BaseKamp Trinoma Branch of Tramper Retailers Incorporated (also owns the Sandugo outdoor brand) and Bad Grass Society. As of now, the nationwide branches of BaseKamp are involve in Tramping Activities. 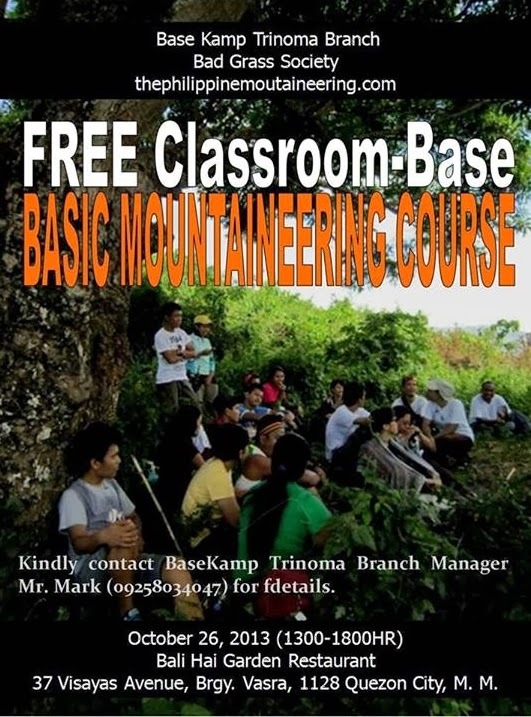 As an opportunity to help to the mountaineering community, admin@thephilippinemountaineering.com will conduct a free BMC in partnership with BaseKamp Trinoma. To encourage everyone to practice responsible mountaineering. To learn the basic mountaineering techniques. To learn the theoretical and practical aspects of mountaineering. To learn how to make a comfortable outdoor experience. To inculcate to view mountaineering as lifestyle and not just a physical or adventure activity. 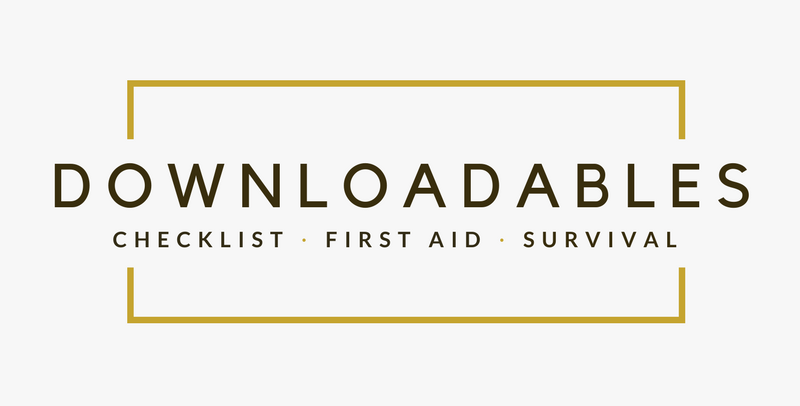 To provide a suitable and relevant literature and reading material on mountaineering. To learn to manage the health in the mountain and outdoor environment. Among the subjects to be discussed during the session by proctors/ mountaineers include: The Beauty of the Philippines, Challenges of Mountaineering in the Philippines, Evolution of Mountaineering, Gears and Equipment, Climb Composition, Basic Outdoor Skills, Areas of Concern in a Local Community, Wilderness Kitchen, Camp Sanitation, and Post- Trip Meeting. Other Organization involved is the Bad Grass Society. BGS is a group of outdoor enthusiast that are bound by a n innate desire to explore, experience and enjoy the marvels of nature with friends and comrades, “Grass” instills honorable practice of mountaineering lifestyle, ethics and discipline among its members. The name Bad Grass describes the group ability to be resilient in whatever challenges we face be it on the great outdoors or in life, much like our namesake which thrives and happily lives by what nature throws at them. This is the second time that thephilmount and Bad Grass Society to conduct a FREE Classroom-base BMC. Other instructors will also be from BGS. All are considered welcome to be part of this activity. These are open to individuals who are seeking for ideas, willing to learn and practice responsible mountaineering. The venue will be at Bali Hai Garden Restaurant, an Indonesian restaurant located at 37 Vizayas Avenue, Quezon City, Philippines. We also want to introduce the Mountain Climbers Alliance of the Philippines (MCAP), Inc. as the support organization of this event. MCAP is an organization that aims to develop the leadership potentials of its individual members while seeking to establish better "standards" for the Filipino mountaineering community. The "Alliance" also aims to endeavor to embark on programs and projects that would benefit its members. MCAP was organized to instill the practical mindset and philosophies of the "old skul" mountaineers for application to current mountaineering situations and circumstances confronting its members. For further details, please contact BaseKamp- Trinoma Branch Manager Mr. Mark (09258034047) or e-mail us at admin@thephilippinemountaineering.com or visit the facebook event page for details Classroom-base BMC event page. We, thephilippinemountaineering.com are open for the possibility of conducting FREE Basic Mountaineering Course for you or for your group, just feel free to communicate.